ALBANY — Chances are good that those introduced to bluegrass within the past half century were listening to Del McCoury and the strumming of his guitar. In that time, he has earned more than 30 awards, including a Grammy Award, a National Heritage Fellowship lifetime achievement award from the National Endowment for the Arts and induction into the International Bluegrass Music Hall of Fame. These are some of the facts that left me somewhat intimidated before our phone interview. Bluegrass was never the kind of music I’d peruse in the retail store, and though I would often claim to be a fan of all sorts of music, bluegrass would challenge me. Classical, country, alternative, disco, funk, R&B, New Jack Swing, hair metal, rap — I own music under each genre. Outside of owning an Eagles CD with “Seven Bridges Road” on it, I can’t say I own any bluegrass music. Through my usual research to prepare for the interview, my anxiety grew. I even reached out to a friend, a big fan. “I have an interview with Del McCoury,” I wrote, “and I’m going to screw this up!” I dialed his number, still not certain how to approach the conversation. A familiar voice answered the phone, but not to assume, I asked for “Mr. Del McCoury.” (I learned a harsh lesson as a first-grader in Humble Elementary in Texas. Unlike here in the Northeast, the use of honorifics like “Mr.” or “Sir” is expected in the South.) The Carolina accent triggered a response from me. In 2016, McCoury performed along with David Grisman at the Experimental Media and Performing Arts Center at Rensselaer Polytechnic Institute in Troy. It was to celebrate the duo’s 50th anniversary of a show they played together at RPI. The two had met previously while playing with the Blue Grass Boys in 1963. To no surprise, McCoury spins a yarn. From anyone else, it would sound like he was name dropping. A conversation with him seldom excludes the name of Bill Monroe, who he played for as a member of the Blue Grass Boys. The association leads many to consider McCoury a first-generation bluegrass performer. He was brought on to sing and play banjo, an instrument you seldom see him play. “Not since 1963,” he said with a laugh. After his older brother, J.C. taught him how to play the guitar, he started listening to Flatt & Scruggs play the banjo. “There weren’t many three-finger style pickers in those days,” said Del. So, he learned through listening to his records. Within a short few years of joining the stage with Monroe, Del was performing in the Grand Ol’ Opry house. People often admire Del’s jovial mood while he’s on stage, something that has never seemed to fail over the years. His demeanor on the phone reflects that, so I feel comfortable enough to confess to him about my stubborn views on bluegrass. I stress an emphasis on stubborn because I can see its popularity and how often its played on local radio. How, too, DelFest in Maryland has successfully drawn in fans and big acts with each passing year. With its roots in traditional Celtic music, there’s a story to hear. As with jazz, each band member gets a chance to stand front-and-center on stage. Replace the banjo and stand up bass with some electric guitars, and you have a jam band. So, I ask him why I feel the need to pigeon hole bluegrass to music exclusively for the South. “You know, I was amazed with the fans that Bill Monroe had in the cities,” said Del. “When I went to work with him, I was playing in Baltimore. … That was a big town for bluegrass.” It was the same town that produced Earl Taylor and The Stoney Mountain Boys, the first bluegrass band to play Carnegie Hall, he said; before Flatts & Scruggs and before Monroe. And, when he played the Grand Ol’ Opry, it was broadcast on a 50,000-watt radio station with a clear channel across the nation. Del taught me that bluegrass was never exclusive to just country. “Everybody listened to that,” he said. Bluegrass’ popularity has blossomed through the years. Del said it’s larger now than it was when he first started. His association with both The String Cheese Incident and Phish is evident of that. Trey Anastasio invited Del to perform with Phish a few years ago. “I wasn’t expecting to play on stage together, because our music is so far away from each other,” said Del. When Anastasio asked for his thoughts about playing “I’m Blue, I’m Lonesome,” a song originally credited to Bill Monroe and Hank Williams, he asked, “Are you thinking of the same Blue and Lonesome I’m thinking of? ”The collaboration that followed introduced scores of young music fans to bluegrass. 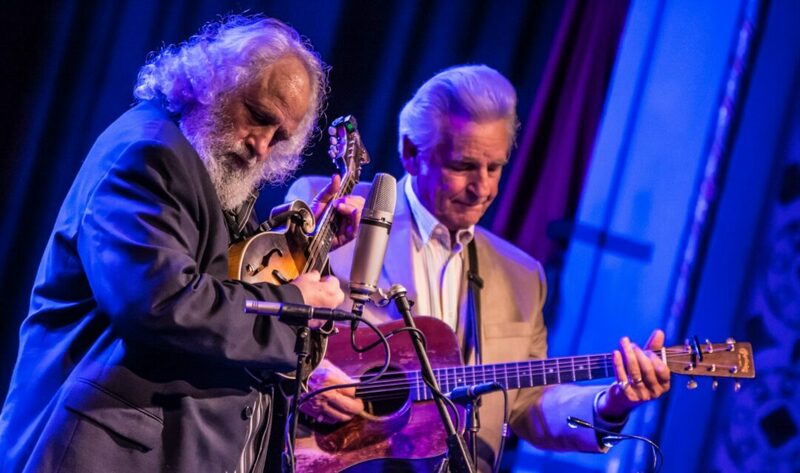 Grisman and McCoury return to the Capital District to play The Egg at the Empire State Plaza on Saturday, Mar. 3. Tickets start at $41.25 and can be purchased at tickets.theegg.org. For more information, call (518) 473-1845, or visit theegg.org.